And the screen went blank. I literally screamed and pounded my fist on the table. Didn't the producers know fans across the world would count the stardates until the season premiere in September. Didn't they know we would speculate -- via pre-social media avenues like email, chat rooms and, gasp, telephone -- on what would happen to Picard and the Enterprise crew? Didn't they know they'd drive Trekkies and Trekkers insane? Well, yes they did, for they incorporated a staple of movie serials decades before -- the cliffhanger. They weren't the first to do it, but they certainly caused a stir when they, pardon the pun, made it happen. And, perhaps, they didn't utilize the cliffhangers which kept kids returning to theaters each week. Perhaps they implemented the cliffhanger method thousands authors had used at the end of each chapter or short story. What makes us humans special, besides our opposable thumbs and six toes, is our never-ending curiosity. We want to know what's going to happen to someone or something, even if it means waiting a few weeks, months, or years to find out. This is why J.K. Rowling was so successful with the Harry Potter series or viewers wait an infinite amount of time to find out what occurs on The Walking Dead or Mad Men. Cliffhangers work extraordinarily well in most story genres to keep a reader's attention. They don't want the chapters to merge into one another. They want to gasp at the last sentence, contemplate what's going to happen, and be eager to read the next chapter then and there, keeping them up past their bedtime, or savor the moment for a later time. The next time you put a book down because you're tired of all the tension and your rapid heartbeat, think of Locutus, the Borg, and the Enterprise crew. You'll come to realize palpable tension is worth it. 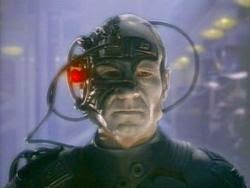 As the Borg love to say ... resistance is futile. Are you a fan of cliffhangers? Hi Rich. I love cliffhangers at the end of chapters, but hate when a book leaves me hanging....until next year when the sequel is due. That's not playing fair. In high school and college, I was a fan of Dallas, a soap opera centered around a Texas oil dynasty. The year J.R. got shot, all the television and movie actors went on strike, but just when I thought we would never find out what happens, they came to an agreement, and the series continued. Now, I wish J.R. had died.